Every morning, Linda Chawanda makes breakfast for her two girls before heading to the hospital to help people living with HIV. Linda is HIV+ and has been healthy on treatment since 2006. She serves as an Expert Patient at our Tisungane Clinic. In this role, she encourages everyone, especially expectant mothers, to get tested and treated for HIV. Most importantly, she inspires people to live healthier lives. On a typical day, Linda guides patients to consultation rooms, assists with tasks like recording patient weights in health passports and counsels newly diagnosed patients. “I feel happy and satisfied to help people who are in a condition similar to mine,” says Linda. 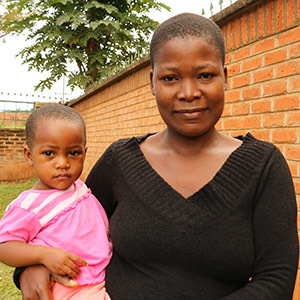 Linda’s baby daughter Chisomo was born HIV-free because of Malawi’s groundbreaking Option B+ program. Under Option B+, pregnant and breastfeeding women are tested and those who are HIV+ are offered lifelong treatment, regardless of the stage of their disease. This ‘treatment as prevention’ regimen ensures that mothers stay healthy and babies are born HIV-free.